Leonardo Ulloa feels he has unfinished business with Brighton after joining the club for a second time this morning. 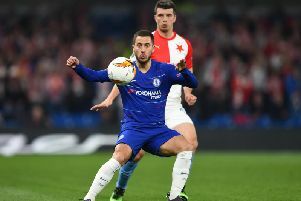 The 31-year-old striker scored 26 goals in 58 appearances after joining from Almeria in January, 2013, and then signed for Leicester in the summer of 2014, where he went on to win the Premier League. After struggling for game time with the Foxes recently, Ulloa joined the Seagulls on loan for the rest of the season this morning. He said: “I feel like there’s unfinished business here and I always felt everything about the club meant it deserved to be in the Premier League. “Everyone knows the quality the boys have and that level has increased in the Premier League – it’s great to be in the division and now we have to do our best we can, and it helps that I know people here. “I feel fit and ready to play, I trained hard every week at Leicester City because I wanted to be ready to show what I can do." Ulloa admitted he feels at home in Brighton and added: “It was an easy decision because I have a unique feeling with this club – they opened the door for me to come into England and I know all about the fans, the club and the city. “This feels like my home in this country – when I’m in the city and the streets I feel different and for that reason I’m happy to be back here. “I had a special relationship with the fans the first time I was here and that’s really good for me – they’re so important to the team. Ulloa also hopes to use his experience of winning the Premier League title to help Albion out for the rest of the season and said: “It was an amazing and wonderful experience, it was a dream year. “When you touch a dream like that it feels different and you can’t explain that feeling, it’s magic and wonderful and we created history – I don’t think you’ll see something like that again for a long time. “Now I have a new chapter and I want to focus on Brighton. I’ve played in the Premier League now and I’ve improved both as a player and a person. “I want to use that to help the team and the club – as well as my ability, to show what I can do."